We’d love your help. 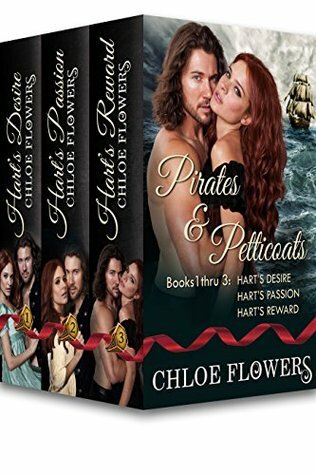 Let us know what’s wrong with this preview of Pirates & Petticoats Saga Books 1-3 by Chloe Flowers. After a daring escape, Captain Landon Hart sails the Desire to Charleston for repairs and to keep a mysterious appointment with a plantation owner. He meets a sword-wielding, fiery-haired tempest on the way, and he isn't prepared for the impact she has on his tightly guarded heart...nor the trouble she manages to attract. Hart's Desire is set just prior to the War of 1812, when privateers sailed the seas looking for enemy merchant ships to plunder. Hart's Desire is a story about a young woman from England, who's suddenly thrust into plantation life as the daughter of the plantation owner. The book is rich with fascinating insights into the Lowcountry of Charleston, the food, the medicines and the lifestyles of the people of that time. Keelan is a very independent woman who is determined to avoid a marriage of convenience. Landon and his business partner dock their ships in the Charleston harbor for repairs. Weeks earlier the merchant fleet owner, Landon's mentor, set up a mysterious appointment with George Grey of Twin Pines plantation-Keelan's father. It is this meeting which forces Landon and Keelan's paths to cross. Keelan has been well-tutored by her father's valet, and not only can she read, write and keep the accounts for the plantation, but she can also fence and defend herself with a dagger. Romance readers will love this spunky heroine and the scoundrel who can't help but fall in love with her. Landon and Keelan’s adventure continues in Hart’s Passion. Captain Landon Hart’s plan to elope with Keelan immediately goes awry when she’s kidnapped by pirates. As usual, the red-haired vixen ends up neck deep in trouble, and it’s not long before she has the pirate captain demanding her head. When they target Landon’s merchant fleet, the only way to keep her safe is to send her away, then lure the pirates into a final confrontation. Can Landon fall in love with Keelan twice in a lifetime? Before Keelan and Landon can pursue the pirates who took her brother, they must complete their mission and smuggle runaways to Philadelphia. When an accident takes Landon’s memories from the past five years, Keelan must fight for their lives as well as Landon’s heart. Overall it was an entertaining and sweet tale of overcoming obstacles for love and what was right and just. Keelan was always funny when trying to make amends for her mistakes when everything was supposed to be all seriousness; Landon was the rogue that tried to bring out her rebel side at the oddest of times so I consider this a romantic comedy of sorts and in a good way. To ask other readers questions about Pirates & Petticoats Saga Books 1-3, please sign up. From The Book Junkie Reads . . . Pirates & Petticoats Series #1 - 3 . . . I had me some fun voyaging back to the early 1800s for some high seas mishaps, romance, and a little adventure. Each of the three books in this series gave me a little something different to enjoy. I was taken back to my early reading years of the historical romance that provided swash buckling heroes and bodice ripping moments. Hart's Desire - Our hero and heroine were in the midst of escaping an arranged marriage, dea From The Book Junkie Reads . . . Pirates & Petticoats Series #1 - 3 . . .
Hart's Desire - Our hero and heroine were in the midst of escaping an arranged marriage, deathbed confessions/secrets, deception, suspense, and romance after the heated/hatred start to things. . . .
Hart's Passion - Action. Adventure. Pirates. Kidnappings. Revenge. Secrets. Truth. . . .
Where the heck have I been, that I did not find these books. Oh My God this set of books is amazing. If I had not got an e-mail telling me about them, I would have missed some great books. These books are well written, well thought out, and full of twist and turn that make for one hell of a read. This is the first book in the series, where we meet Keelan and Landon. And when the meet it was truly a shock to Him and his best friend Chonal. I have to say I loved when she walked off pulled Where the heck have I been, that I did not find these books. Oh My God this set of books is amazing. If I had not got an e-mail telling me about them, I would have missed some great books. These books are well written, well thought out, and full of twist and turn that make for one hell of a read. This is the first book in the series, where we meet Keelan and Landon. And when the meet it was truly a shock to Him and his best friend Chonal. I have to say I loved when she walked off pulled the Scarf from her hair and he froze it was truly a great moment in the book. Then when he blackmails her into giving him a kiss that is when all the fun begins. Landon is there to find out what his uncle was on his way to find out from Keelan’s father Commodore Grey. And then there is the Crazy Dr. who wants Keelan to be his wife, and she feels obligated to the doctor, as he has been there though her fathers illness. But in the mean time she has started to fall for Landon. And she does not know what to do. She just knows she cannot marry Mr. Pratt the old wealthy landowner her father and Uncle want her to marry. Can Landon convince her to marry him and run away with him. before time runs out and she is forced to marry a man she dose not love. If you have not read book one yet you may not want to read this review as it has a few spoilers. Now as I said this is book two, and man what a read, these books just keep getting better. My hubby however is not too fond of them though. As I cannot seem to put them down when I have a spare moment. I went as far as taking them with me in the car. I even sat in the car while he did the grocery shopping. This first book leaves off with Keelan agreeing to marry Landon, but before they can run away her father tells her a great secret. She is not his daughter. But he has left her with this knowledge of where to find her true family. Only after doing so he passes away. But also leaving questions in Keelan’s mind, did he die of an illness? or was it murder? And when you find out the truth all the pieces and clues throughout the book will all make sense. After her father’s funnel she rushes to pack and meet Landon. But the crazy doc is there to ruin things again, which has her uncle locking her in her room. But she has a plan to escape, unfortunately that too goes wrong when she is taken by pirates. And what happens while as their captives will shock you. Will Landon get there in time to save her? Or will she have to save him. If you have not read book one and two yet you may not want to read this review it has a few spoilers. storm. During this storm Landon jumps in the way of flying debris to protect Keelan. But in doing so he is hit in the head and looses the last five years of his memory. Which me and he has not clue who Keelan is or that she is his wife. Wanted for murder now and her husband not knowing who she is has taken its toll. She tries all kinds of things to remind him but none seem to work. When the reach Charleston the one person you will never believe will confirm her statement that she is indeed his wife will shock you. Then the pirates find out she is back and she loses someone close to her as he jumps in front of a knife meant for her. Grief stricken she soon finds out Landon is in trouble. And now it is up to her and her cousin to save him and it is one hilarious rescue. Now she just has to hope he regains his memory or at least help him fall in love with her all over again. And get her happily ever after, after all. Pirates & Petticoats is an entertaining historical series featuring the independent and beautiful Miss Keelan Grey and the irresistible rakish Captain Landon Hart. The box set contains the Hart's Desire in which Keelan and Landon meet due to him being stranded in Charleston for repairs to his ship and in which we find Keelan in a situation where she is trying to avoid marriage with the cruel and disgusting Mr. Pratt. Their attraction is immediate and a secret is revealed which had Keelan nee Pirates & Petticoats is an entertaining historical series featuring the independent and beautiful Miss Keelan Grey and the irresistible rakish Captain Landon Hart. The box set contains the Hart's Desire in which Keelan and Landon meet due to him being stranded in Charleston for repairs to his ship and in which we find Keelan in a situation where she is trying to avoid marriage with the cruel and disgusting Mr. Pratt. Their attraction is immediate and a secret is revealed which had Keelan needing a husband in the worst way. The next book is Hart's Passion, in which Landon and Keelan are planning to elope, but she is kidnapped by pirates. With her head at stake, it's a race against time for Landon to rescue her and the unthinkable happens leading into the next book, Hart's Reward. Hart's Reward is not only full of the problems with pirates, but an accident takes Landon's memory and their relationship is thrown an obstacle that seems to be one that can't be conquered. Keelan has to fight to keep her place on Landon's ship and push her way back into his heart making the reader wonder: Can she do it? What if the same passion and feelings don't come back? I loved each and every story, but Hart's Reward had me enthralled. I was so worried that they wouldn't find their way back together. I shouldn't have worried...these two were like another Rhett and Scarlett. I loved their banter, passion, etc and it made for a very enjoyable read. I definitely recommend the Pirates & Petticoat's series for anyone who loves to take a step back in time and get lost in mystery, intrigue, passion, and love. Monthly email subscribers at http://www.chloeflowers.com are entered into a monthly drawing for a signed print copy of their choice of any book in the Pirates & Petticoats Series. Chloe Flowers is an award-winning author, the recipient of the University of Akron, Wayne College 2018 Writer of the Year Award, and writes small town contemporary w Monthly email subscribers at http://www.chloeflowers.com are entered into a monthly drawing for a signed print copy of their choice of any book in the Pirates & Petticoats Series. Chloe Flowers is an award-winning author, the recipient of the University of Akron, Wayne College 2018 Writer of the Year Award, and writes small town contemporary women’s fiction, and historical women’s action and adventure romance novels about scoundrels, pirates, and spunky, independent heroines. Chloe’s constantly looking for the next adventure. Her pets have always been named after her favorite characters or action heroes: Indiana, Luke, Gimli, Thelma, Rocket, Forrest, Al Giordino, Severus, Mushu, Mérida, Gibbs, Jack…Dead Pool (he’s a goldfish). Chloe’s biggest fault is the apparent inability to say “no” whether it’s in response to a call for aid or a double-dog-dare to hike home through 30 acres of a snow-covered forest at midnight…during a full moon. It was early morning during said adventure when she came upon a group of sheriff’s deputies searching for a lost girl. So, of course she offered to help (turns out, they were searching for her). She has a weakness for good red wine, Calvin & Hobbes comics, pie, dark chocolate and brown-eyed guys with beards, which is probably why she digs pirates, men in uniform and treasure hunters and writes about action and adventure and of course romance, which is the greatest adventure of all.